We have been eating from our garden all winter and it's fantastic. 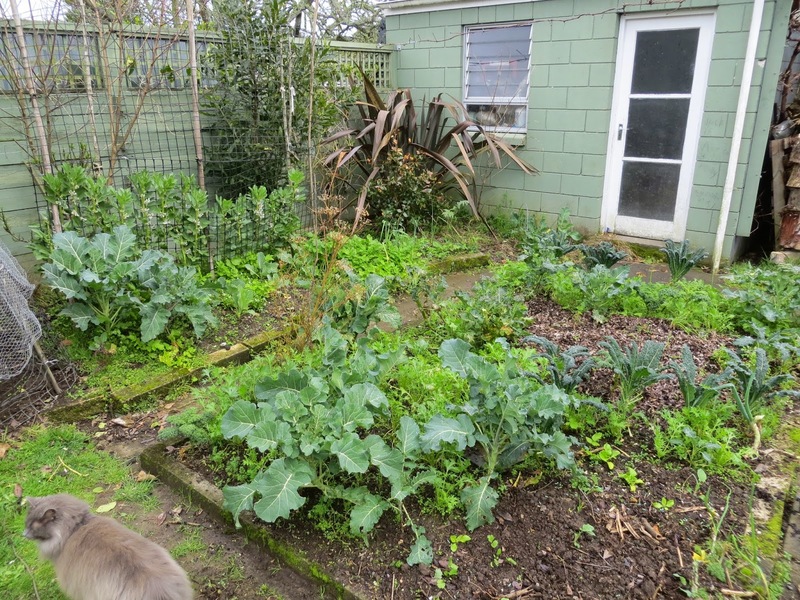 New Zealand is a great place to garden, even in frosty and sometimes-foggy urban Hamilton. A lot of people don't bother with a winter garden. (Do they really have to eat that floppy, expensive supermarket broccoli?) We've been mostly sustained by salad and to-be-cooked greens from our garden. It's in our fairly small backyard which gets several hours of shade from our house when the sun dips low in winter. Yet things grow sufficiently and they are delicious, convenient and so, so cheap. Here's how we did it. The secret is to get cracking early. In February and March, when there's so much garden produce you're giving it away, we sprouted our winter seeds. Firstly I went through a seed catalogue (Kings Seeds, but you might also consider Koanga Gardens or Egmont Seeds). I much prefer to look through a paper version of a catalogue, scrawl out a list, and place my order on-line. 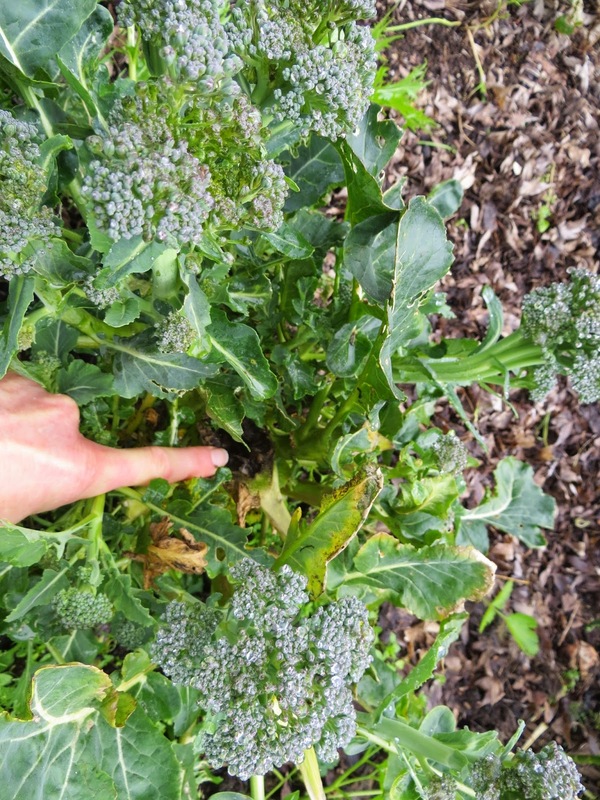 Do not be stingy here: a packet of seed costs little more than a single head of broccoli when prices climb in winter. If you leave it too late, the plants won't get enough growth on them before it gets cold and the days get too short. If this happens many of then will stay small until spring, at which point you'll have missed the winter boat and have been at the mercy of supermarkets and suchlike. Still, you'll well on board the spring boat. Then I got sowing. At that time of year seeds sprout really fast. The two drawbacks are that because it's so hot you need to be very careful they don't dry out, and there are generally clouds of white butterflies around that lay eggs on many seedlings, which are then devoured by caterpillars. Such a waste of effort! The solution is netting of some sort, for example old net curtains, draped over top. (This post shows our draped late-summer garden, and this post shows how I now cover my seedlings with the help of a fortuitous side-of-the-road discovery). Plant the seedlings out as soon as they're big enough and you have space, preferably with large amounts of home-made compost. If you know how to avoid using slug and snail pellets, tell me how and I'll spread the word. At this point we have to use them or we'd have no vegetables. Salad greens. 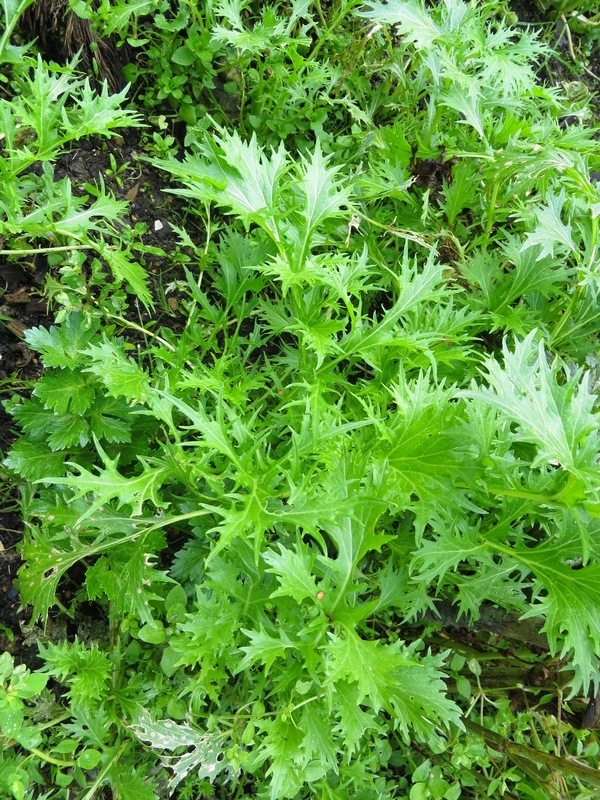 Look for salad greens that thrive over winter. Most lettuces survive fine, but they don't grow much. We planted purple and green mizuna, mustard greens, rocket and beetroot. (I don't like beetroot, but their leaves are pretty good.) These plants thrive in the cold and don't mind a frost. Plant as much as you can: even if you can't eat it all, it protects the soil and suppresses weeds all winter, and when it flowers in spring it feeds the bees. 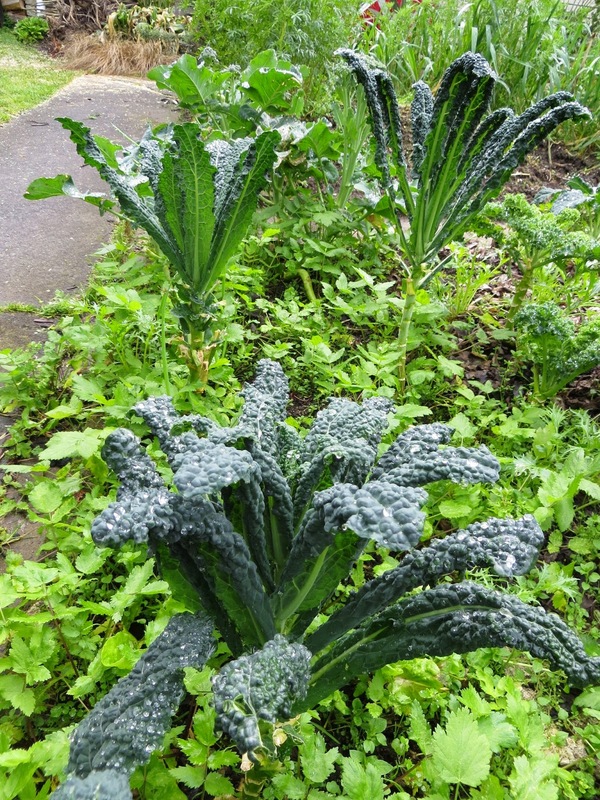 Plant it among brassica plants to cram more into your space. These greens are slightly bitter, but I have developed a taste for them and now crave my wonderful salads garnished with sundried tomato, red onion and feta. I'm almost dreading the mildness of summer lettuces - will my tastebuds even notice them? - but my taste will change again. Just remember to harvest this stuff when it's not frozen stiff by frost because it goes mushy. 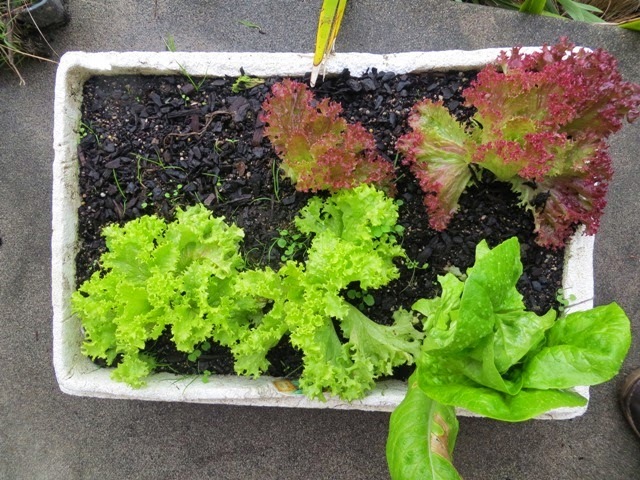 Another alternative is to grow some summer lettuce in a warm sunny spot. The big polystyrene box I use was given to me by a fruit shop when I asked - their grapes come in these boxes. Polystyrene, though environmentally foul, is a good insulator. Brassica. You want a long harvest season, not 12 heads of cauli in July and then no more. I chose different types of broccoli, a couple of 'sprouting' types and some standard heading types. Also look for a mixture of 'early' and 'late' varieties. That way you can plant them all in late summer or early autumn so they reach a decent size, then harvest each as it comes ready. 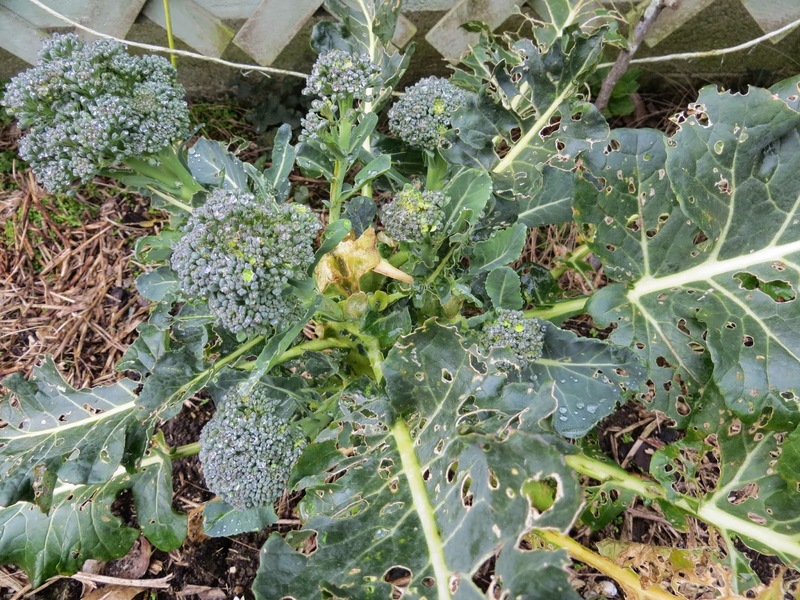 The other thing to look for is re-sprouting ability, which broccoli are great at. The secret is to leave a little side sprout when you cut a head of broccoli. That side sprout will turn into another big head for your dinner without you having to do anything else. Often that happens even if you don't leave a side shoot. Happy, lazy gardening. Not beautiful, but continually productive. Also, grow kale! I avoided it for ages because it was so fashionable that I was suspicious of it. But it's very easy to grow, gives a long and constant harvest when you just pick a few leaves from each plant, and tastes great. It's much, much more delicious than cabbage, and seriously healthy. I feel a kale and herb omelette coming on for lunch. My hens are being generous these days. I never have much luck with spinach, but a few silverbeet plants are excellent. Ours have been getting an annoying rust problem which we don't know how do deal with (tips, anyone? ), although not all of it at once. If you have chickens, keep them strictly away from silverbeet. (Do as I say, not as I do!) Otherwise you'll have a silverbeet famine and be deprived of green smoothies. Our oregano, sage and parsley have done well all winter, and the coriander's been fine too. Coriander prefers cool temperatures - probably not as cool as it has been, but at least it doesn't bolt to seed like it does in summer. Also, don't work too hard. 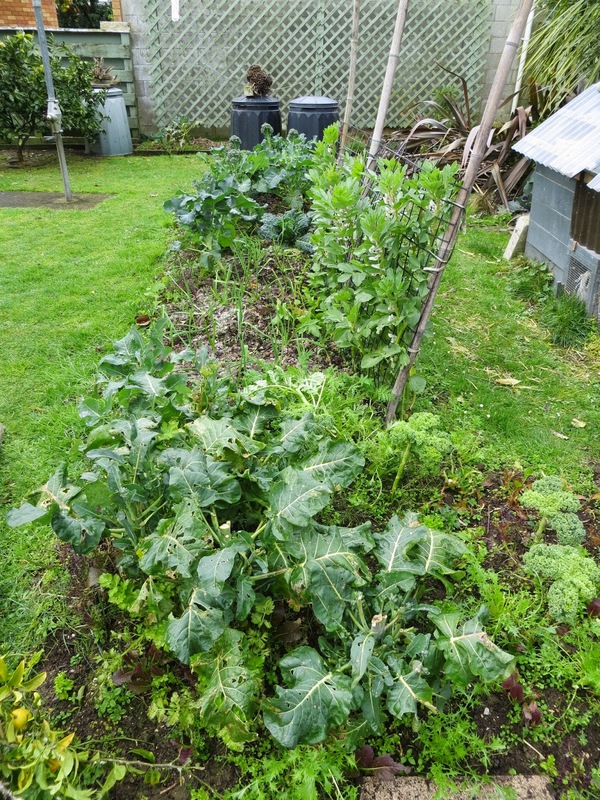 No one's going to give you an award for a weed-free garden, the weeds grow fairly slowly at this time of year, and the vegetables still keep coming. I do try to pull grass out from the garden, though, because it's hungry and steals nutrients from the vegetables. The chickens love it. DISCLOSURE: I have bought 4-5 heads of broccoli and a cabbage this winter. Once or twice a week we have frozen peas or beans. I think we provide 80% of our own greens. Hopefully you can find this post again at the start of next year when you need it! Maybe you could bookmark or pin it on Pinterest? 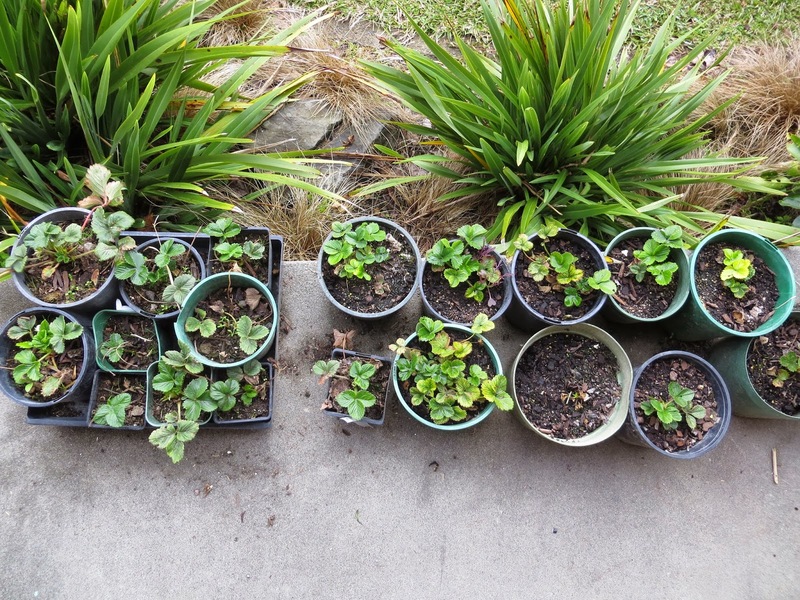 In the meantime, it's summer seed raising time NOW, and our strawberry plants need to get into the garden - they're already trying to fruit. More on that soon. That post is definitely going bookmarked! You gave so much information and you explained everything really well! I'll use your advices next year!